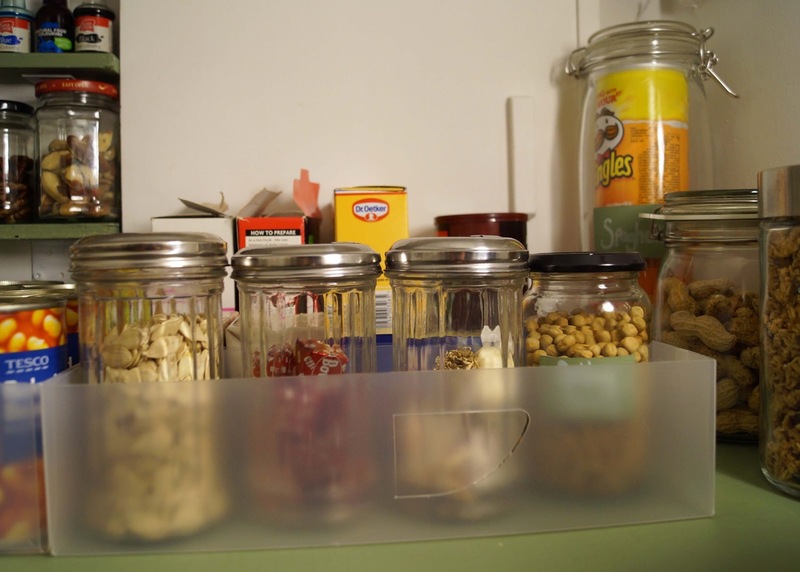 buttons and paint...: ... and a Kitchen Cupboard Spring Clean with a Crafty Twist! 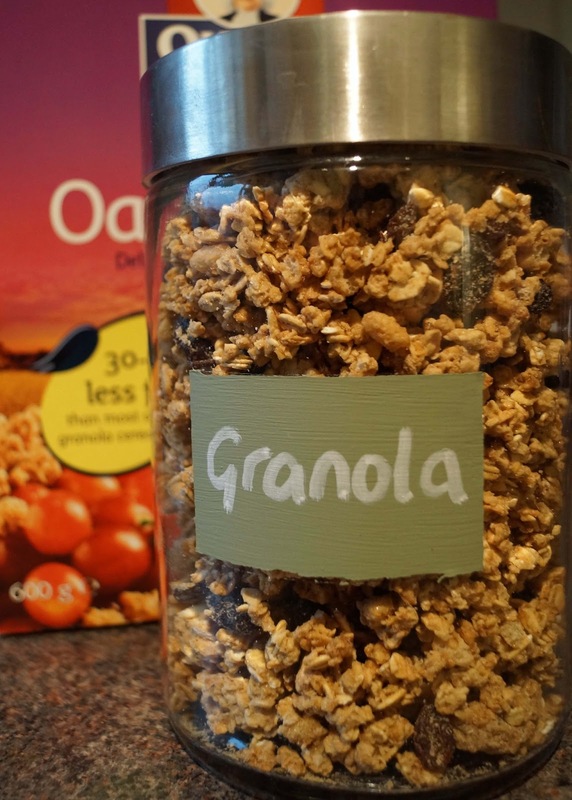 ... and a Kitchen Cupboard Spring Clean with a Crafty Twist! Last weekend I had planned to do some spring cleaning... but then it snowed!! As it wasn't really the weather for hanging out washing and cleaning windows, I braced myself and decided to tackle the kitchen cupboard instead, which has been on my 'to do' list for a while! 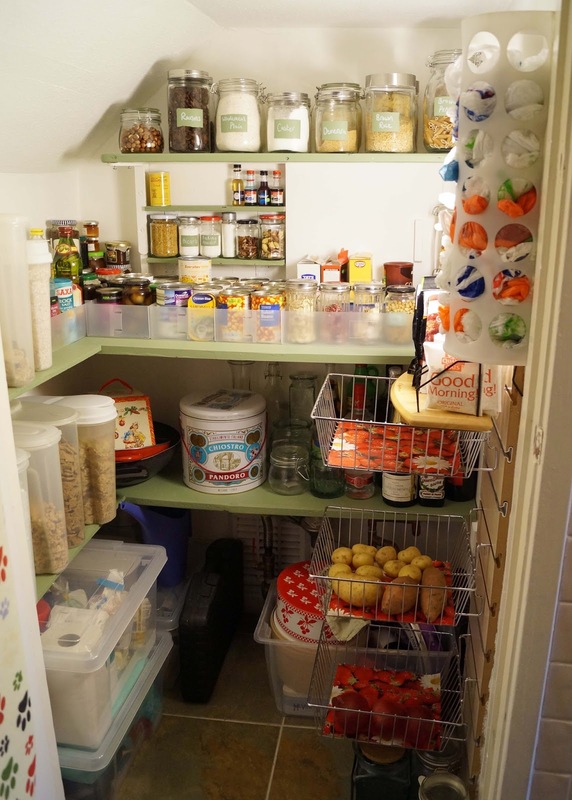 In our kitchen we have a cupboard, which I guess you could call a larder/pantry (although that makes it sound a lot bigger than it is!). It has a tendency to become a bit of a dumping ground and I forgot to take any 'before' photos, but trust me...it was definitely in need of a good sort out! Firstly I went through all the tins and packets and worked out what was actually still in date. 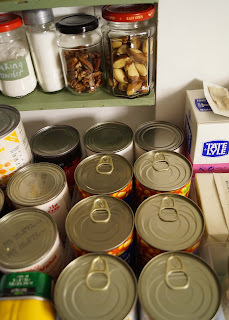 I must confess I did find a some of tins lurking at the back which were a 'couple' *ahem* of years out of date... Now having an empty cupboard, I thought the plain white shelves looked a bit boring - so painted them green with leftover paint from our dining room. This then reminded me of something I'd seen on Pinterest... chalkboard paint!! 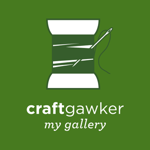 There are lots of pins about how to make your own chalkboard paint, but the basic recipe is: 1 cup of paint to 2 tbs of tile grout. I had a little tester pot which was quite handy to mix everything together. Making your own chalkboard paint also means that you can match it to your colour scheme and use up any leftover paint - perfect for labeling all my storage jars! To create the label for each jar, I marked it out with masking tape, painted on the chalkboard paint (about 4 coats) and left to dry. 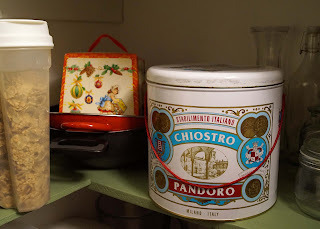 Once I'd decided what was going in each jar, I used a chalk pen to write on each label. The beauty being that if you change your mind it's easy to wipe off the chalk and start again! 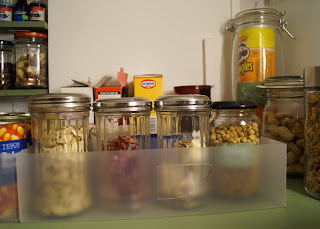 Plastic drawer separators (the ones you use to organise socks!). A letter rack found in a charity shop, to store loose packets. Wire hanging baskets, with some bright vinyl off-cuts to line the bottom for storing veg. A tin I'd found in a Sheffield charity shop and loved - turned into a bread bin! Tupperware containers for cereals and clear storage boxes to keep all the other 'bits' neat and tidy. 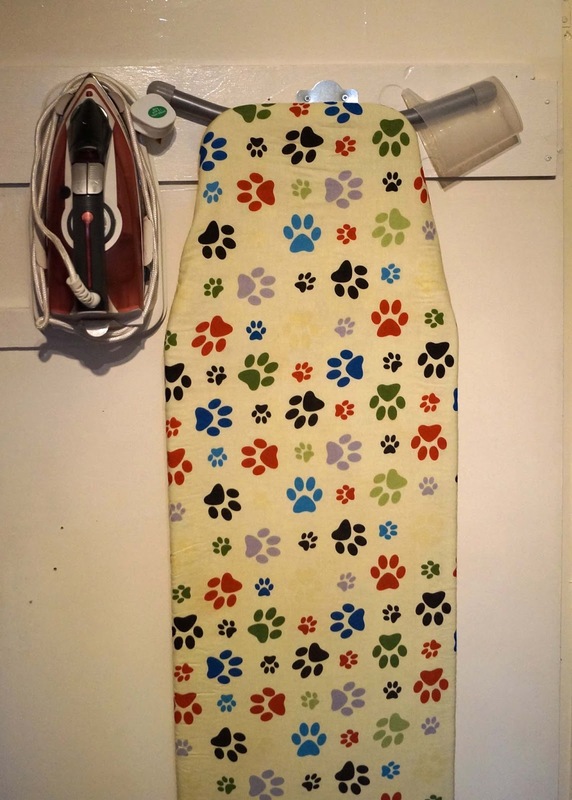 We now also store our iron and ironing board on the back of the door, which keeps it out of the way. I also thought I'd share with you our magnetic noticeboard which is on the front of the cupboard door.... basically it's a piece of mdf, cut to size and painted with magnetic chalk paint! You can buy this paint in DIY stores and is fab!! 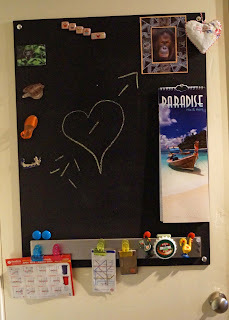 The strip at the bottom is a metal strip screwed onto the board, which is good for heavier magnets and hanging things from. 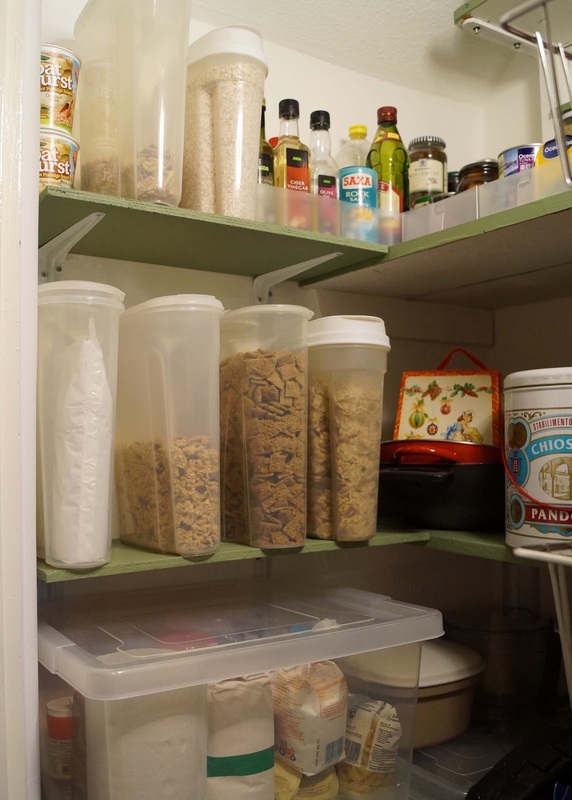 So there you go... kitchen cupboard organised! It's definitely not going to rival Martha Stewart... but it does the job and hopefully I can keep it looking like this! 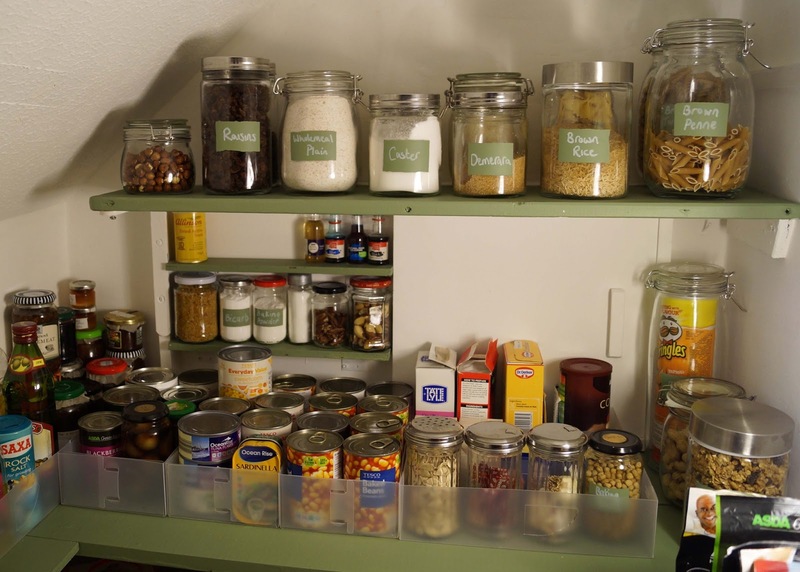 I love this post, I shall take inspiration from your fab organisational skills and attempt a bit of cupboard sorting tomorrow I think. Looks fab! 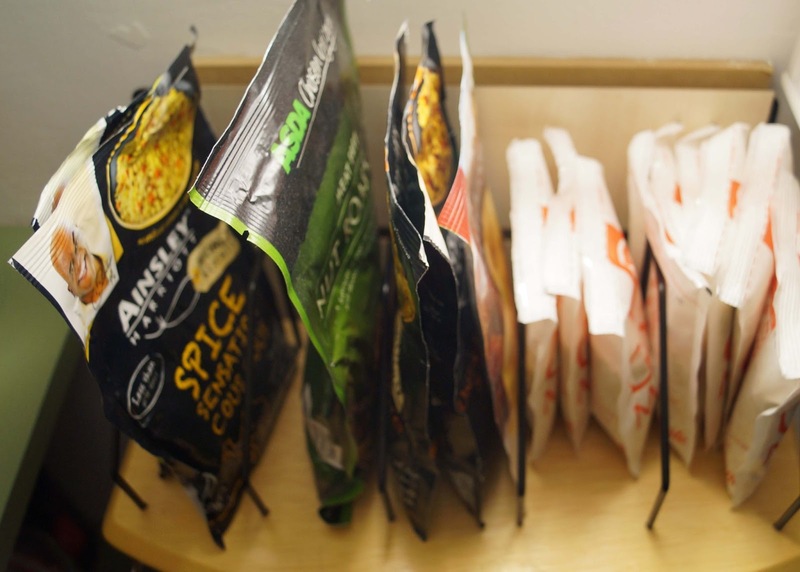 I never thought of using a mail sorter to organize loose packets - very cool! I hear you about the expiration dates. I'm guilty of holding onto stuff way longer than I need to. I would love for you to share this at my Fabulously Frugal Thursday linky - it's so inspirational. Clearing out cupboards is always satisfying...hopefully it will last!! I so enjoy looking at other people's pantries. 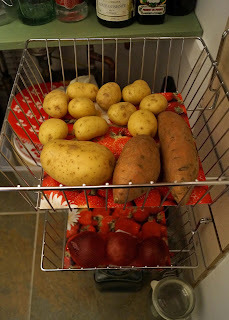 :-) I need to get some wire baskets for my vegetables, too. 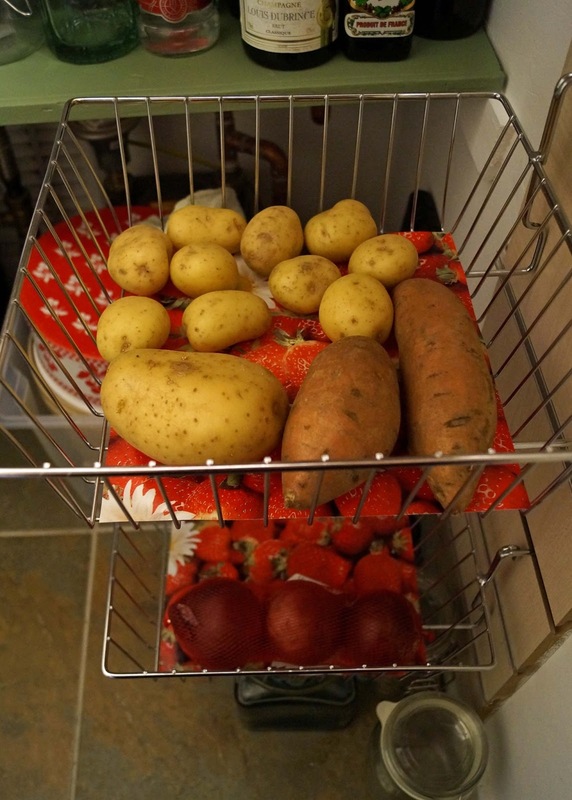 The wire baskets definitely come in handy!